CollegeBooks – It’ll Show All The College Bookstores In Your Area! If you are a college student, you know the struggles of finding books for class and finding them at a cheap rate to fit your college budget. CollegeBooks by Pure Creations, Inc. is exactly what you have been needing. 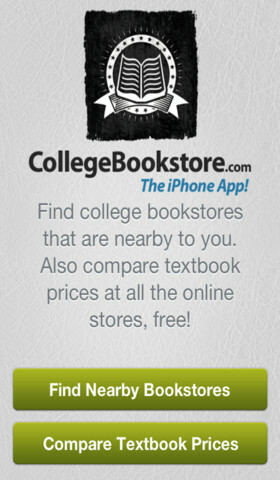 This is an amazing app to help you locate college books stores and the books at the lowest cost. This is an all in one app all college students should download today. The best part, it’s perfect for the budget, as it’s a FREE app for your iphone. This app is amazing. All you have to do is search for the bookstore in your local area. 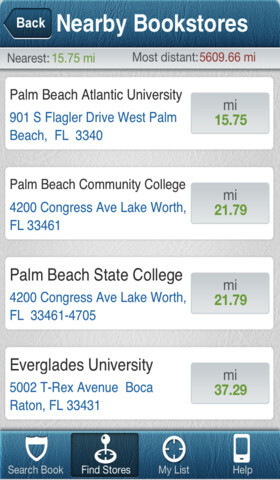 The app will yield results featuring all the stores near you. You will be provided with a map of the locations, all the online information to include websites, phone number, or whatever you need to secure your book search. It’s a true one stop shop for all your book needs. You will love it. The next great part about this app is the ability to find the book you are looking for and shop for similar selections and better pricing all over the web. That’s right, a single place to compare all the pricing needs to ensure you are getting the best deal on the book you need. Again, this app is excellent and a real life saver for college students. * Fast and accurate results. * I wish I did not have to call to find out if the book was out of stock. * I need a membership to ensure I can always get the best deal first.